The long-term effects of successful immune therapies for treatment of type 1 diabetes have not been well studied. The Autoimmunity-Blocking Antibody for Tolerance (AbATE) trial evaluated teplizumab, an Fc receptor non-binding humanised anti-CD3 monoclonal antibody in individuals with new-onset type 1 diabetes, and ended in 2011. Clinical drug-treated responders showed an increased frequency of ‘partially exhausted’ CD8+ T cells. We studied the clinical, immunological and metabolic status of participants after an average follow-up of 7 years. Participants with detectable C-peptide at year 2 of AbATE returned for follow-up. C-peptide responses were assessed by 4 h mixed-meal tolerance test. Autoantibodies and HbA1c levels were measured and average daily insulin use was obtained from patient logs. Peripheral blood mononuclear cells were analysed by flow cytometry and cytokine release. Fifty-six per cent of the original participants returned. Three of the original control group who did not return had lost all detectable C-peptide by the end of the 2 year trial. The C-peptide responses to a mixed-meal tolerance test were similar overall in the drug vs control group of participants but were significantly improved, with less loss of C-peptide, in drug-treated responders identified at 1 year. However, the improvements in C-peptide response were not associated with lower HbA1c levels or insulin use. Drug-treated responders showed a significantly increased frequency of programmed cell death protein 1-positive central memory and anergic CD8+ T cells at follow-up. These findings suggest there is reduced decline in C-peptide and persistent immunological responses up to 7 years after diagnosis of diabetes in individuals who respond to teplizumab. ClinicalTrials.gov NCT02067923; the protocol is available at www.immunetolerance.org (ITN027AI). The online version of this article ( https://doi.org/10.1007/s00125-018-4786-9) contains peer-reviewed but unedited supplementary material, which is available to authorised users. Type 1 diabetes is a chronic autoimmune disease caused by destruction of pancreatic beta cells, a process thought to be primarily mediated by pathogenic cytotoxic T lymphocytes . This generally leads to clinically insignificant beta cell function, glycaemic variability and dependence on exogenous insulin. Immune therapies, given at the time of diagnosis, delay beta cell loss in the short term [2, 3]. However, it is not clear whether the effects of these treatments are long-lasting and whether they will result in long-term improvement in glycaemic measures or even improvement in beta cell function. Following a single course of rituximab, the preservation of C-peptide that was identified after the first year was absent in the second year, whereas alefacept treatment showed a greater improvement in C-peptide after year 2 than year 1 [4, 5, 6]. One year after continuous treatment with abatacept for 2 years, a statistical difference in C-peptide responses remained between the drug- and placebo-treated participants, but with continuous decline in the responses . 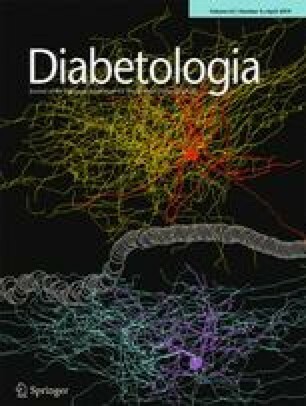 A longer follow-up of individuals treated with otelixizumab, a humanised Fc receptor (FcR) non-binding anti-CD3 monoclonal antibody (mAb), suggested that insulin requirements were reduced up to 4 years following study entry but the differences in C-peptide responses were no longer statistically different between the drug- and placebo-treated groups . The Autoimmunity-Blocking Antibody for Tolerance (AbATE) trial showed that two courses of teplizumab (a humanised FcR non-binding anti-CD3 mAb) reduced the decline in C-peptide 2 years after onset of disease overall in the drug-treated vs control participants . In addition to the effects on C-peptide, there was improved HbA1c and insulin use in the drug-treated group. A post hoc analysis of the study participants suggested that the responses were dichotomous. Forty-five per cent of the drug-treated individuals showed a very robust response and lost less than 10% of their baseline C-peptide response whereas 55% showed changes in C-peptide that were indistinguishable from untreated control participants . Identifying individuals who are most likely to show long-term responses to treatments is a key objective for improving the efficacy and safety of clinical studies. Studies of the AbATE and the Delay trials of teplizumab identified a mechanism in which CD8+ T cells were rendered inactive. Clinical responses were associated with an increased frequency of CD8+ T cells that showed markers of T cell exhaustion or partial exhaustion [10, 11]. It was proposed that induction of CD8+ T cells in which expression of T cell immunoreceptor with Ig and ITIM domains (TIGIT), killer cell lectin-like receptor G1 (KLRG1) and eomesodermin (EOMES) was increased accounted for the clinical efficacy , but it was not known whether these or other immunological effects would persist and lead to long-term responses. Here we present follow-up data on participants originally enrolled in the AbATE trial, now followed, on average, for more than 7 years after diagnosis. 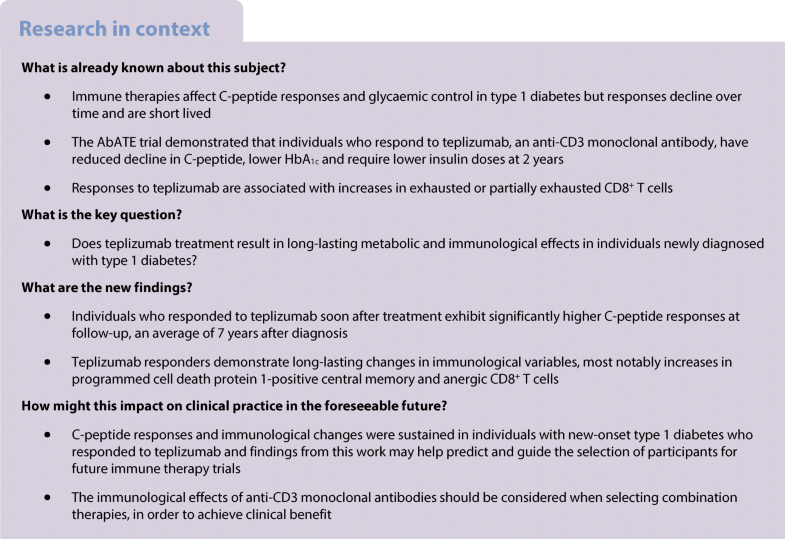 The goal of this study was to assess long-term effects of teplizumab on C-peptide response, clinical variables, immunological profiles and safety following the end of the trial. We investigated the metabolic and immunological features during the initial study period that would predict C-peptide responses at follow-up. We also analysed the effects of anti-CD3 mAb on immune cell subsets that may predict responses and help guide the selection of individuals in whom treatment would achieve lasting effects. The AbATE trial was a randomised, open-label study conducted at six medical centres between 2005 and 2011. Eligible individuals were 8–30 years of age, autoantibody positive (anti-GAD65, anti-ICA512 or islet cell autoantibodies [ICA]), and newly diagnosed with type 1 diabetes within 8 weeks of enrolment. The study period was 2 years. Institutional review board approval was obtained at each institution and written consent was obtained from all participants. The study was registered at ClinicalTrials.gov (registration no. NCT02067923) and the protocol is available at www.immunetolerance.org. The research designs and methods of AbATE have been described . Participants were randomised in a 2:1 ratio, drug:control, within randomly ordered blocks. AbATE was an open-label study and placebo infusion was not given to the control group, but core laboratory personnel were blinded to treatment assignment. Electronic supplementary material (ESM) Fig. 1 shows the progression of participants through the study period and in this follow-up. The original intention to treat (ITT) analysis consisted of 25 control participants and 52 drug-treated individuals. The drug treatment group received a 14 day course of teplizumab administered intravenously (median cumulative dose 11.6 mg, interquartile range 5.7 mg) at study entry [13, 14]. Participants in the treatment and control groups performed 4 h mixed-meal tolerance tests (MMTTs) every 6 months for 2 years. Forty of 52 individuals in the drug treatment group received a second dose of teplizumab (median cumulative dose 12.4 mg, interquartile range 5.08 mg). Fifteen participants did not receive the full two doses of treatment: 12 discontinued treatment after receiving part of cycle 1 (n = 6) or all of cycle 1 and prior to receiving any of cycle 2 (n = 6, 4 due to predefined laboratory abnormality and 2 withdrawn) and three discontinued after initiating cycle 2. The presented follow-up study was designed at the conclusion of the clinical trial. The rationale was to determine the long-term effects of the drug treatment, particularly in the drug-treated responders who had shown a very robust response in the 2 year study period. In the current follow-up study, individuals with detectable C-peptide responses in the 4 h MMTT at year 2 of AbATE were asked to return and underwent a 4 h MMTT (follow-up visit 1) (n = 43). If they had detectable levels of C-peptide at that visit, they returned approximately 1 year later for repeat studies (follow-up visit 2) (n = 12). Participants had last received treatment 6.03 ± 0.20 years prior to follow-up. Follow-up visit 1 occurred 7.02 ± 0.15 years from baseline (median [range] 6.70 [5.32–9.22] years) and follow-up visit 2 occurred at 7.35 ± 0.20 years from baseline (median [range] 7.30 [6.33–8.80] years). Insulin use as average U kg−1 day−1 over the 3 days prior to the study visit was obtained from patient logs. Autoantibodies (GAD65, insulin autoantibodies [IA]-2, microinsulin autoantibodies [MIAA] and zinc transporter 8 [ZnT8] autoantibodies) were measured by radioimmunoassay at the Barbara Davis Center (Aurora, CO, USA) and immunofluorescence was tested at the University of Florida. C-peptide and HbA1c levels were measured by two-site immunoenzymometric assay (Tosoh, San Francisco, CA, USA) and ion-exchange high-performance liquid chromatography (Bio-Rad Diagnostics, Hercules, CA, USA) at the Northwest Lipid Research Laboratory (Seattle, WA, USA). The lower limit of detection in the C-peptide assay was 0.03 nmol/l. Peripheral blood mononuclear cells (PBMCs) were processed and stored at Yale University, Department of Immunobiology. Frozen vials of PBMCs were sent to Benaroya Research Institute for analysis by flow cytometry with antibody panels shown in ESM Table 1. T cell phenotyping was performed on PBMCs, as previously described , on an LSR-Fortessa (BD Biosciences, San Jose, CA, USA) with FACS Diva software and analysed with FlowJo software version 9.5 (Tree Star, Ashland, OR, USA). All samples from the same individual were run on the same day and an internal control from the same individual was run each week to identify any machine or staining issues. T cell phenotypes were identified by marker staining as ‘exhausted’ (programmed cell death protein 1 [PD-1]+KLRG1+CD57−) or ‘anergic’ (PD-1+KLRG1−CD57−) and were expressed as a percentage of CD4+ or CD8+ cells. Central memory cells were CD4+ or CD8+CCR7+CD45RO+. An example of the gating strategy is shown in ESM Fig. 2. T regulatory cells (Tregs) were identified as CD4+CD127loFOXP3+. Previously frozen cells were used in functional assays. Cells were sorted by FACS into CD45RO+CCR7− and CD45RO+CCR7+PD-1+ CD8 or CD4 populations using PE mouse anti-human PD-1, APC mouse anti-human CD4, FITC mouse anti-human CD45RO, V450 mouse anti-human CCR7 (BD Biosciences) and PerCP/Cy5.5 anti-human CD8a, HIT8a (Biolegend, San Diego, CA, USA). Cells were plated into 96-well tissue culture dishes and were either left untreated or stimulated with 2.5 μg/ml phytohaemagglutinin (PHA) for 24 h. RNA was isolated using RNeasy Plus Micro Kit (Qiagen, Hilden, Germany), converted to cDNA (High-Capacity cDNA Reverse Transcription Kit; Applied Biosystems, ThermoFisher) and quantitative PCR (qPCR) was performed using QuantiFast SYBR Green PCR Kit (Qiagen). Primer pairs were as follows (5′ to 3′): ACTB forward CATGTACGTTGCTATCCAGGC, ACTB reverse CTCCTTAATGTCACGCACGAT, IFNG forward TCAGCTCTGCATCGTTTTGG, IFNG reverse GTTCCATTATCCGCTACATCTGAA, IL2 forward AACTCCTGTCTTGCATTGCAC, IL2 reverse GCTCCAGTTGTAGCTGTGTTT. The ACTB housekeeping gene was used for normalisation and gene transcription is presented as ΔCt = CtACTB − CtIFNG and ΔCt = CtACTB − CtIL2 for IFNG and IL2, respectively. The area under the C-peptide response curve (AUC) was calculated over the 4 h MMTT using the trapezoidal rule, divided by the time (240 min) and transformed to loge (loge [(AUC/240) + 1]), and is presented as C-peptide AUC in nmol/l. Results reported as below detection level were designated as 0 for AUC analysis. Three of the individuals in the control group had lost all detectable C-peptide at the year 2 visit. These values were used in the prediction analyses shown in Figs 3 and 6 but were not used in other studies since these individuals did not return for the follow-up visit. The time interval from diagnosis until the follow-up visit was large and therefore the primary analysis was corrected for the duration of diabetes. Because of sample availability, some flow analyses were not available for all participants. The data were analysed with GraphPad (version 7) (La Jolla, CA, USA) and mixed models were performed with SAS (version 9.4) (Cary, NC, USA). Unless indicated, all data are presented as mean ± SEM. A p value <0.05 was considered to be statistically significant. Of the 77 original participants analysed in AbATE, follow-up data were available from 43 (56%): 31 in the drug-treated group and 12 in the control group (ESM Fig. 1). Those who returned were younger than who did not (age 12.03 ± 0.47 vs 14.44 ± 0.98 years, p = 0.02) but there were no significant differences between the subgroups of the returning participants. The stimulated C-peptide levels at the time of enrolment were similar in the individuals who did and did not return for follow-up (0.513 ± 0.026 vs 0.528 ± 0.026 nmol/l, difference not statistically significant). Among returners, the demographic data was similar between groups (Table 1 and ESM Table 2). The time from diagnosis to the follow-up visit was variable but not significantly different when comparing the control and drug-treated individuals (ESM Fig. 3). The previously used definition of drug–treatment responses was based on a comparison with the control participants at month 24 which was not relevant to the comparison at the follow-up visit. We used a definition based on the absence of a change in C-peptide from baseline to 1 year (i.e. <7.5%) used previously in clinical studies [4, 11, 15]. This criteria was more stringent than the criteria previously reported—two of the previously designated responders were reclassified . The frequency of drug-treated responders was not significantly different in those who did (10/43, 23%) and did not return (10/33, 30%) for the follow-up visit. Overall, the C-peptide responses were not significantly different at the follow-up visit when comparing the drug-treated and control groups. However, the drug-treated responders demonstrated a significantly greater C-peptide response than the control group and drug-treated non-responders (p = 0.34, p = 0.01, p = 0.004, mixed model corrected for duration) (Fig. 1a, b). Similar to findings during the 2 year study period, the drug-treated non-responders showed C-peptide responses similar to that of the control group. The frequency of individuals with detectable levels of C-peptide was higher among the drug-treated responders vs non-responders or control individuals (Fig. 1c). The frequency of individuals with stimulated C-peptide >0.2 nmol/l, a measure of clinically significant residual beta cell function , was highest in the drug-treated responders (40% vs 16.7% in control participants and 14.3% in drug-treated non-responders) but the differences between the three groups were not statistically significant (not shown). We also evaluated the change in C-peptide as a percentage of the baseline, at the follow-up visit and corrected for the duration of diabetes. Overall, the control individuals and drug-treated individuals lost more than 80% of their baseline responses (range 24–100%) (p = 0.24). However, the drug-treated responders lost significantly less C-peptide compared with the drug-treated non-responders and the control group (Fig. 1d). To determine whether the C-peptide differences were persistent, we invited individuals who had residual C-peptide responses at follow-up visit 1 to repeat the MMTT 1 year later (n = 12). 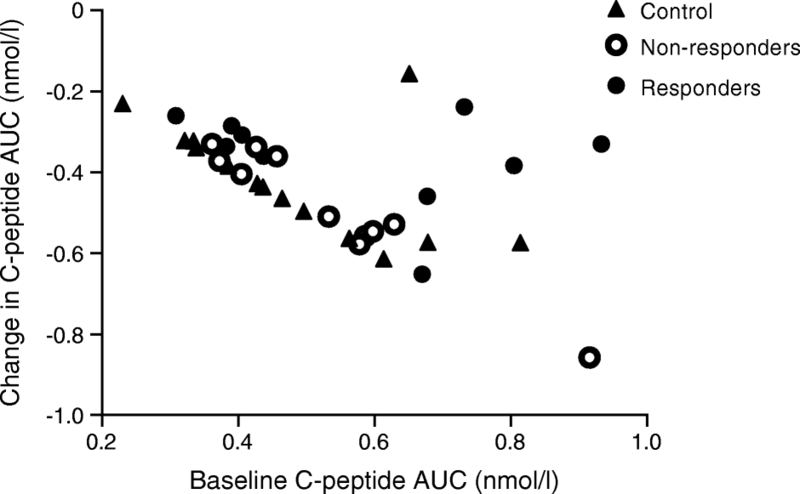 The average stimulated C-peptide level had fallen in 10/12 individuals and overall by 22 ± 7.1% (0.144 ± 0.052 vs 0.120 ± 0.043 nmol/l, difference not statistically significant, Fig. 1e). To assess the changes in C-peptide over time, we compared the responses at each study visit using a mixed model. The C-peptide responses were greater in the drug-treated responders compared with the drug-treated non-responders or control participants at all time points, including the follow-up visit (Fig. 2a). Age has been suggested to affect responses to teplizumab. When age was considered in the mixed model across all time points, the C-peptide response was higher in the older vs younger individuals in the control group (p = 0.0004) but a significant age interaction was not found among the drug-treated responders, drug-treated non-responders and control participants (p = 0.515). Insulin use and HbA1c levels were significantly lower in the drug-treated responders than in the drug-treated non-responders or control participants at visits during the first 2 years but not at the follow-up visit (Fig. 2b, c). There was a modest inverse relationship between the C-peptide AUC and daily insulin use (Pearson r = −0.34, p = 0.028) but not HbA1c (not shown). Major adverse events were captured at the time of the follow-up visit (ESM Table 3). Since the year 2 visit, a few events of severe hypoglycaemia had been reported but they were more frequent in the control participants and drug-treated non-responders (difference not statistically significant), consistent with the retention of C-peptide. The rates of mild respiratory and other infectious complications were similar in the three groups. Other adverse events were Grade 1 and 2 and none of the recalled adverse events were considered to be related to the study drug. The titres of anti-ZnT8 (p < 0.01) and IA-2 antibodies (p < 0.001) declined but MIAA (p < 0.001) increased over time (ESM Fig. 4). The titres of anti-GAD65 antibody did not change significantly. Antibody titres were not different among the treatment groups overall. The C-peptide AUC at study entry predicted the decline after 7 years in the control and non-responder groups (r = −0.70, p = 0.005 and r = −0.84, p = 0.002, respectively, Spearman’s) but not in the teplizumab-treated responders (r = −0.30, p = 0.41) (Fig. 3). We identified changes in CD8+ T cells that were associated with clinical responses during the 2 year study period [10, 11, 12]. To determine whether these markers persisted or whether their expression predicted the long-term response, we analysed PBMCs by FACS . At the follow-up visit, there was a significantly greater frequency of PD-1 expression on central memory CD8+ T cells in the drug-treated responders than in the drug-treated non-responders or the control individuals (Fig. 4a, b). To further define the changes in the PD-1+ T cell subsets over time, we analysed selected cell subsets during and after the trial with a mixed model (Fig. 4c–f). There was an increase in the frequency of exhausted CD8+ T cells (PD-1+KLRG1+CD57−), anergic CD8+ T cells and anergic CD4+ T cells (PD-1+KLRG1−CD57−), during the study period and, for the CD8+ anergic cells, at the follow-up visit. We did not identify differences in the frequency of CD4+ Tregs between the three groups. To evaluate the functional characteristics of the PD-1+ cells, we stimulated PD-1+ CD8 central memory T cells (CD45RO+CCR7+) with PHA and measured IFNG and IL2 gene expression by qPCR. We used effector memory cells (CD45RO+CCR7−) as a control population. The expression of IFNG and IL2 was increased in the effector memory CD8+ T cells and IFNG was increased in the PD-1+ central memory cells but IL2 was not induced in the PD-1+ central memory cells (Fig. 5a, b). The responses of this subset of cells were similar in all three groups of participants. To determine whether the changes in T cells that had been seen at the end of the study period would predict long-term C-peptide responses, we compared the change in T cell subsets at year 2 and the C-peptide response at the follow-up visit. Although the data were variable, there was a direct relationship between the changes in PD-1+CD8+ central memory T cells, anergic CD4+ T cells and exhausted CD8+ T cells and the C-peptide responses at the follow-up visit (Fig. 6). The induction of anergic CD8+ T cells or Tregs was not predictive of maintenance of the C-peptide response (not shown). Immune modulators have improved C-peptide responses in the short term in individuals with new-onset type 1 diabetes but there have been few studies that have followed patients to determine the long-term effects of treatment. We studied participants in the AbATE trial of teplizumab up to 9.4 years after diagnosis of diabetes. Control participants were followed up for a shorter period of time than drug-treated participants but the difference was not statistically significant and the durations were overlapping. Importantly, the drug-treated individuals did not receive continuous immune therapy during the 2 year study period and last received treatment 6.03 ± 0.20 years before they returned. 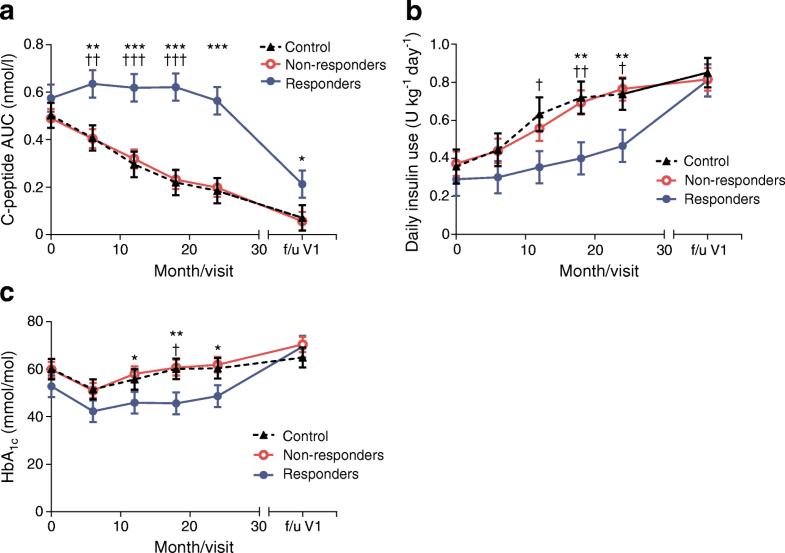 We found that drug-treated participants who showed robust responses at 1 year showed improved C-peptide responses at the long-term follow-up visit. A greater frequency of these participants retained detectable levels of C-peptide compared with the drug-treated non-responders and the untreated control participants. The differences between the subgroups of participants are actually more robust than we report from the individuals who returned for follow-up. Three individuals in the control group had undetectable levels of C-peptide by the year 2 visit and did not return for follow-up, so their data was not carried forward. We did not, however, find differences in HbA1c levels or insulin use among the participant subgroups. The frequency of hypoglycaemia, another correlate of retained insulin production, was reduced in the responder group but the frequency of severe events was low and the difference between the groups was not statistically significant. Our studies from this and other trials of teplizumab show that changes in CD8+ T cells suggestive of induction of cellular exhaustion may serve as a biomarker of response. Our studies of cells before and at the follow-up visit were consistent with this previous observation. We found increased frequencies of PD-1+ on CD8+ central memory T cells, exhausted CD8+ T cells and anergic CD8+ T cells, as well as anergic CD4+ T cells, in participants exhibiting clinical responses to teplizumab treatment. There were direct relationships between induction of PD-1+CD8+ central memory T cells, exhausted CD8+ and anergic CD4+ cells at the conclusion of the original study period (at 2 years) and the C-peptide response at follow-up. The phenotypes of T cells were associated with functional differences since the PD-1+CD8+ central memory T cells did not produce IL-2 when activated with mitogen but the responses of the cells were similar in all three groups of participants. This suggests that the frequency of the cell subsets is changed by the drug treatment. Our findings show that teplizumab treatment in the first 2 years has lasting effects on C-peptide responses and suggest that changes in T cell subsets may affect disease progression. Unlike previous studies of teplizumab in individuals with new-onset type 1 diabetes, we did not identify a difference in the C-peptide response to drug treatment between younger and older individuals even though the overall C-peptide responses were greater in the older individuals. Previous studies compared individuals aged 15 or 17 years and older but our study group only included five individuals aged >15 years and one aged >17 years [13, 17]. Therefore, our individuals >12 years of age were similar to those classified as young individuals previously. Although the C-peptide responses remained significantly improved in the drug-treated responders identified at year 1, the C-peptide responses declined in all participants after 2 years. Shorter-term studies of individuals with new-onset type 1 diabetes have examined change in C-peptide from the baseline. When we corrected the analysis for baseline C-peptide levels, the results were similar to those shown in Fig. 2a (from a mixed model: control participants or drug-treated non-responders vs drug-treated responders, p < 0.001) and the p value describing the difference in the drug-treated non-responders and drug-treated responders at the follow-up visit was 0.07. The relationship between the C-peptide at entry and the total loss at the follow-up visit was disrupted by drug treatment, indicating that the normal progression of disease had been altered and the outcomes were not the result of a bias in randomisation. We do not know the reason for the continuous decline—the effects of the treatment on T cells waned during the follow-up period based on tracking of the affected subsets, suggesting that repeated dosing of anti-CD3 mAb or another immunological agent that can target tolerance pathways may be an appropriate combination strategy. The decline in beta cell function despite the persistent changes in T cell subsets suggests that agents that can affect beta cells themselves might be a good adjunct treatment. Despite the improved beta cell function we did not find significant differences in insulin use, HbA1c levels or frequency of severe hypoglycaemia; the frequency of severe hypoglycaemia was lower, the difference did not reach statistical significance. Of note, drug-treated responders had a lower insulin requirement and HbA1c at follow-up than at baseline but the difference was not significant. At the time of follow-up, exogenous insulin use and C-peptide responses were inversely correlated, consistent with several other reports showing that residual production is sparing for the need for exogenous insulin [13, 16, 18]. During the clinical trial, the participants were seen on a regular basis and were in contact with certified diabetes educators with the goal of ‘treat to target’ of HbA1c. The greater attention to the clinical management as well as the higher levels of insulin production during the active study period may account for the absence of metabolic differences in the follow-up period. These findings suggest that to maximise the benefits of immune therapies, attention to clinical care is required and possibly agents that have complementary activity on metabolic control are needed. Agents that enhance the residual insulin production may be useful for improving metabolic control. Even 7 years after the end of the clinical trial, we found differences in some T cell subsets in the drug-treated responders compared with the control individuals and drug-treated non-responders. The changes in the T cell subsets were not associated with clinical histories of infection or other adverse events. The continued differences in PD-1+ memory CD8+ T cells, which include exhausted and anergic cells, and anergic CD4+ T cells among the groups and residual C-peptide responses suggest that induction of these cells may be associated with the preservation of C-peptide after the initial study period. Signs of T cell exhaustion, such as reduced expression of the IL-7 receptor and increased expression of EOMES, TIGIT and KLRG1 on CD8+ T cells, were associated with clinical responses among drug-treated participants in analyses during the treatment period . The PD-1+CD8+ central memory T cells produced IFNγ when stimulated with PHA but did not produce IL-2, unlike the effector CD8+ cells which produced both. 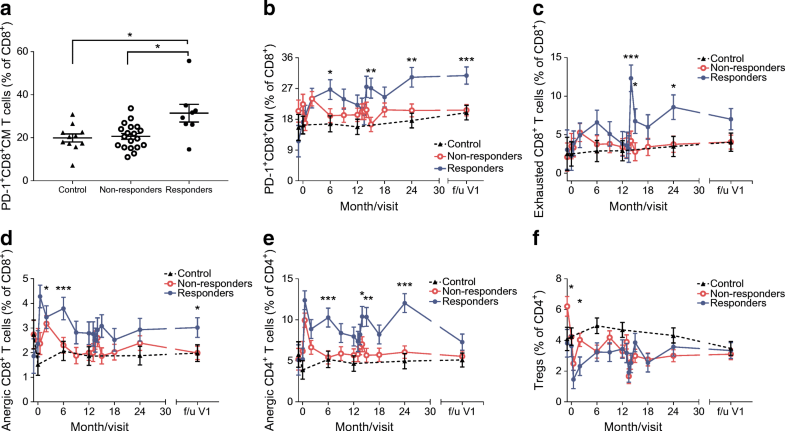 We did not find differences in the response of this subset between the groups of participants, but the PD-1+CD8+ central memory T cells were more numerous in the drug-responder group, suggesting that the frequency of the cells, rather than differences within subsets, characterise the change in immune responses. Our analysis did not investigate antigen-specific T cells and, therefore, the actual effect on pathogenic effector cells is still not known. Nonetheless, these findings may serve to identify individuals who respond well to teplizumab treatment and identify strategies for maintaining tolerance. There are limitations of this study. First, we did not have data on all of the original participants—we were able to study only 56% (43) of the original 77 participants. Importantly, the individuals we studied were distributed similarly to the original study group but with a larger number of participants, we would have greater power to detect differences between the groups. The T cell analysis that we performed by flow cytometry was based on previous studies of the mechanisms of action of teplizumab. It is possible that by using an unsupervised approach we might identify additional markers that are associated with clinical responses in the long term but may not have been identified within the first 2 years. In summary, we found that C-peptide and T cell markers of response remain in individuals with type 1 diabetes, who were treated with teplizumab, for more than 7 years after diagnosis. Our findings suggest that combinations of immune or metabolic therapies are warranted to preserve the immunological responses that are associated with remission, preserve C-peptide responses and achieve outcomes having a clinical impact. The authors express their gratitude to L. Rink and L. Feldman (both from Yale Center for Clinical Investigation, Yale University, USA) for their help in recruitment and evaluation of participants. ALP, PPH, PC, SAL, PSL, SEG, CJG, PAG, AW, JD and KCH acquired and analysed data and wrote or revised the manuscript. KMH, JD, AW and WH analysed data and revised the manuscript. All of the authors approved the final version of the manuscript. KCH is the guarantor of this work. This study was supported by grant 17-2013-501 from the Juvenile Diabetes Research Foundation and grant DK057846 from the National Institutes of Health. The flow cytometry analysis was sponsored by the Immune Tolerance Network and supported by the National Institute of Allergy and Infectious Diseases of the National Institutes of Health under Award Number UM1AI109565. ALP was supported by grant T32DK007058 from the National Institutes of Health. The content is solely the responsibility of the authors and does not necessarily represent the official views of the National Institutes of Health. KCH is a member of the Scientific Advisory Board of Provention Biotech and a Scientific Advisor for Tiziana Life Sciences. All other authors declare that there is no duality of interest associated with their contribution to this manuscript.